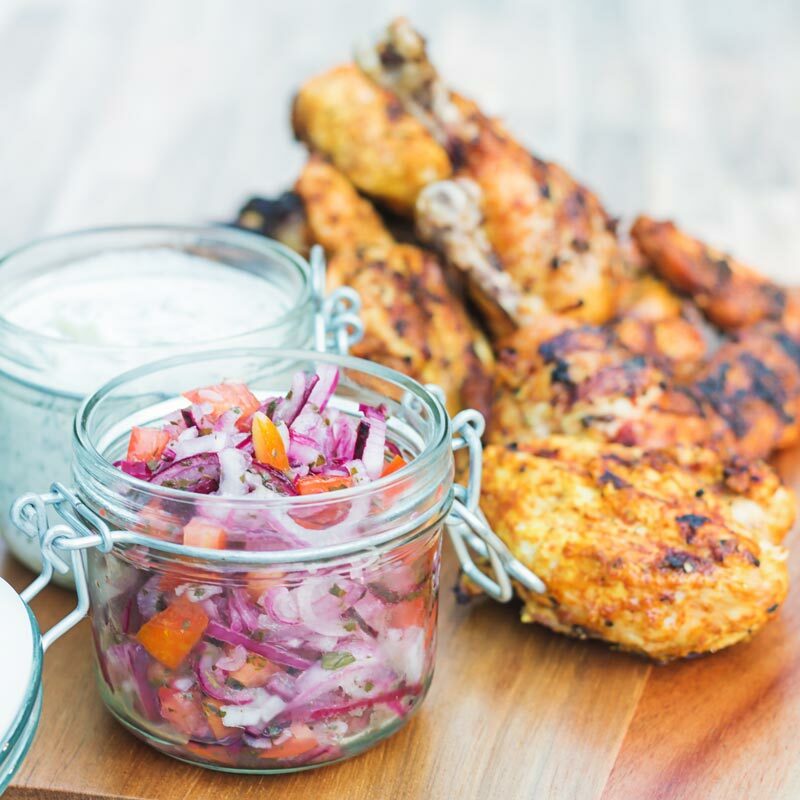 The BBQ is the perfect place to cook a Tandoori Chicken unless you count a Tandoor, of course, take your fakeaway to the next level! The first thing you may notice about my tandoori chicken recipe is that it is not bright red. The simple truth is that the colour of tandoori chicken comes from colouring either food die or occasionally beetroot powder. It adds no flavour or texture to the tandoori chicken whatsoever. Regular readers will know that I rarely… Ok never add anything to my dishes unless it adds flavour or texture. As a result, the food die and beetroot powder are out. But despite the colour difference, this dish tastes full on Tandoori chicken! I just don’t get why anyone would taste a dish and think, wow that tastes great but what it needs is to be red. Hmmm, let me think, go fetch me the food die? It really is lost on me however if you must and feel the need for red tandoori chicken then fill yer boots. It really will taste no different but if it makes you feel better. In fact, a huge amount of Indian food makes, what I consider to be, dubious use of colour. For instance, a chicken pathia in the UK would often be the most vibrant red colour. And obviously tandoori orange or red. Cooking Tandoori Chicken On The Barbecue. This recipe is damn good so much so that my wife is now demanding this dish on a weekly basis. I used to cook this in the oven and it was good but on the BBQ it really raises it up several notches. Traditionally Tandoori dishes are cooked in a clay tandoor oven fired by wood or charcoal and can reach temperatures approaching 500°C. Something I have been threatening to make at home for a long time but never quite got around to. Now the BBQ can’t quite reach those temperatures but they are capable of reaching temperatures higher than most domestic ovens. I get mine up towards 340-350°C. You also get that telltale char as well as a light smokey flavour that is so associated with a good tandoori chicken. If you are a fan of tikka that you should consider using your grill in summer for that too. Chicken Tikka is essentially tandoori chicken off the bone. I will make both my duck tikka masala and chicken tikka masala recipes largely on the grill over summer! How to Butcher A Chicken. 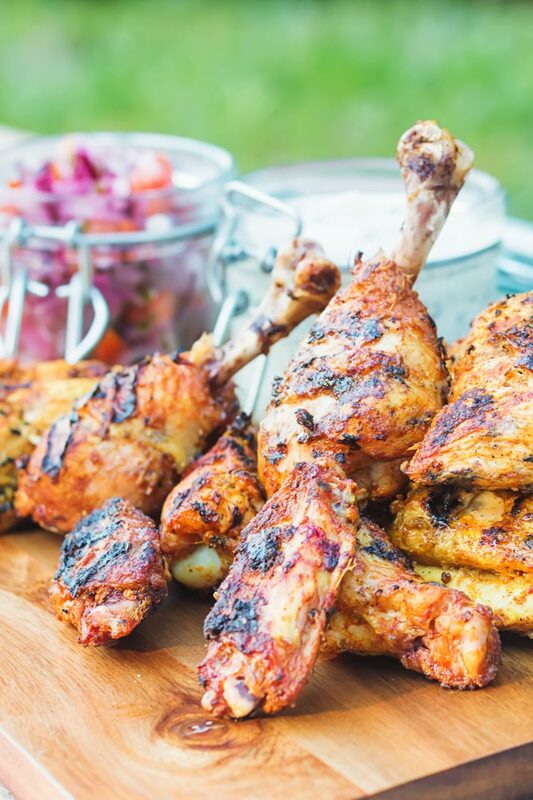 This BBQ Tandoori Chicken recipe uses the whole bird. But, when it comes to the chicken, it is cheaper and better to grab yourself a whole bird and cut it up yourself. It really is not that difficult as you can see from the video above. It also means you get a nice variation of cuts of meat and typically a better quality bird. Chicken really is the most versatile meat. Whether it be chicken kofta meatballs, my zaatar chicken legs or even my petits pois a la Francaise. You can trust the humble chook to keep you going. You also get a big bonus in the bits and pieces that are left over. I use them to make chicken stock. Just roast it off the carcass with onion, carrot, celery and chuck it in the slow cooker with a bay leaf, a little salt and some peppercorns. Then let that bad boy sit there for 4-8 hours, then bish bash bosh you have some glorious chicken stock. 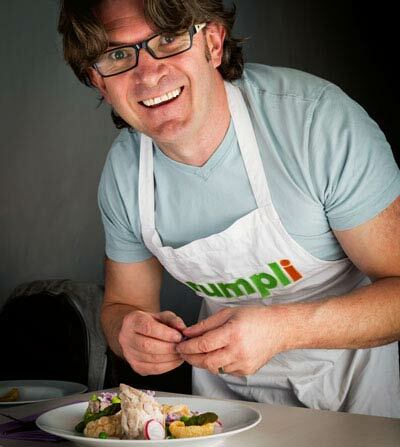 Cooking on the BBQ is so much more than Burgers and Sausages... 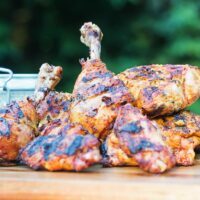 This recipe takes a whole chicken and breaks it down to form the most incredibly glorious BBQ Tandoori Chicken. 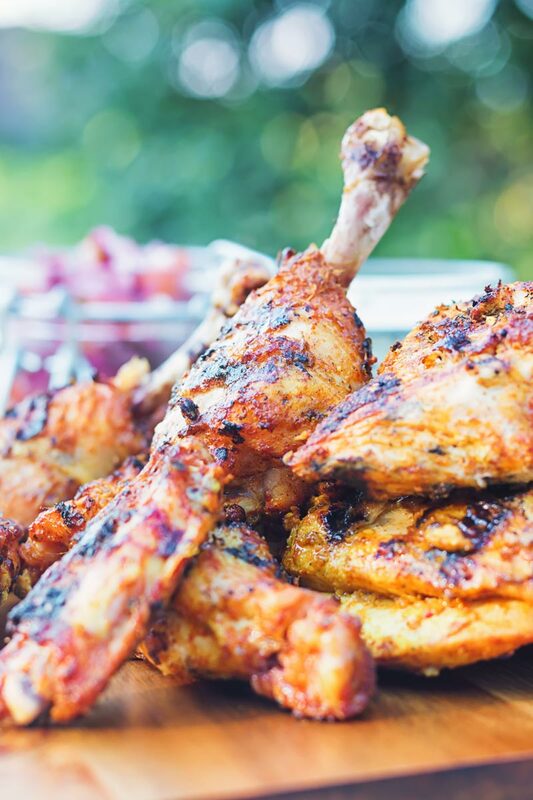 Nothing short of a Tandoor oven cooks tandoori chicken like the grill! Mix together the ingredients for marinade 1 and place in the fridge for an hour. Place all of the ingredients for marinade 2 in to a small blender and blitz to for a paste. Add it to the chicken and first marinade and mix to cover and allow to sit for at least 4 hours, you can extend this 4 hour marinade to overnight if you wish. Mix together all of the ingredients for the onion salad and set aside. Mix together all of the ingredients for the raita and set aside. Get your grill really hot making sure you have both a direct and indirect heat zone. Begin with the cuts of chicken on the bone, so to begin with sear off the drumsticks and thighs so you have a good char on both sides and then transfer to the indirect heat zone and then close the lid and cook for 5 minutes. Then add repeat the process the with chicken wing parts, when charred move to the indirect heat area close the lid again and cook for a further 5 minutes. Now sear off the chicken breasts, moving to the indirect heat zone and close the lid and cook until the internal temperature reaches 73°C. Set aside to rest for 5 minutes before serving and sprinkle with a pinch of chat masala before serving. Serve with a minty yogurt raita and some tomato and onion salad on the side. I love tandoori chicken and yours sounds amazing! Interesting about the red colour. I didn’t know that! In you recipe what do you do with marinade 1 after the hour? Do you add that to marinade 2 and the chicken for 4 hours or overnight? Sorry Charlie… Yes, add it to the chicken keeping the first marinade in there too. I have updated the recipe to make that clearer. I bet the flavor on this is incredible! I love bbq tandoori together– sooo good! I bet it would be a hit at a party. It definitely always goes down a storm. Hello! Red Velvet Cake anyone? I agree with you about added color. Color does influece taste perception … but still. Anyway, with chicken, I think the red is misplaced. Red is not a good color for chicken. Yours looks firely and delicious. Cheers Jeff, I can honestly say I have never tried red velvet cake but in all fairness I don’t have much of a sweet tooth and rarely bake at home. I can’t believe how irresistable you can make chicken look! This sounds and looks perfect. I love the Indian flavors … mmmmmm! Aww you’re too kind Whitney! We haven’t used the grill much this summer but that’s definitely something I’m fixing with this recipe before it gets too cold to! I’m lovin’ it, the first time with a grill for a number of years and it is such a chilled and social way of cooking. This looks fabulous Brian, and the tomato and onion salad with it no doubt tastes divine! Tandoori chicken looks absolutely fantastic, I love so many tandoori recipes. One of them is Tanddor Paneer , have you tried ? Thanks Jagruti… I have to confess to not being a lover of Paneer, I find it has very little flavour and whilst that allows it to convey the flavours in a sauce or marinade I find it all a little meh. Yum, this looks so good! 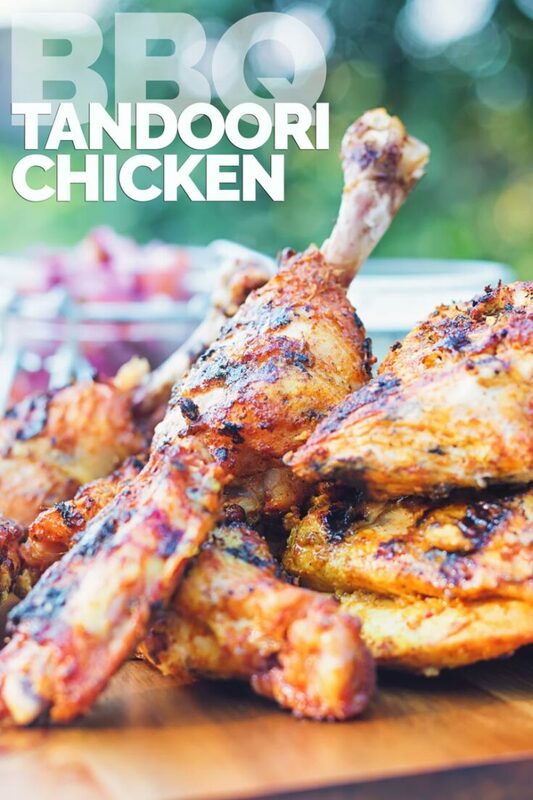 I have never tried tandoori chicken before, I will have to make this one! Looks absolutely delicious. Have pinned and shared on my FB page!! YUM!! Color aside, these look delicious! Definitely no need for beetroot powder and the like. Thanks Sarah, they really are fantastically tasty! That chicken looks perfectly cooked. I love the marinade too, and I bet it has a ton of flavour.